Powering up an electric truck takes patience. Batteries typically take hours to fully juice. Charging stations aren’t as ubiquitous as Starbucks. Freight movers are trying to develop a faster solution. A first-of-its-kind test is in motion in Southern California to charge electric and hybrid trucks by allowing them to temporarily latch onto overhead wires strung over the road. The so-called catenary system — named for the U-shaped curve caused by a chain hanging from its ends — has been around for more than a century and is used worldwide for street cars, buses and light rail systems. But updated technology could allow trucks to pick up power while driving at full speed, without emitting the pollution associated with fossil fuels. Such a system would also bypass the weight of massive onboard batteries and the time spent finding or waiting for a charge. Amid high demand for goods delivery, proponents say the catenary model could make the freight industry more eco-friendly, efficient and even cost-effective. German engineering giant Siemens is readying to test the technology next year in Carson, Calif., with funding from the district, the Environmental Protection Agency, the California Energy Commission and several other partners. The company is installing a one-mile catenary system for trucks near the Los Angeles and Long Beach port complex — the largest port system in the country. The electrical lines are located on the north- and southbound sections of Alameda Street at the intersection with Sepulveda Boulevard. A 200-yard test track was completed late last year and is now functional. The full one-mile system is undergoing final permitting steps and is expected to start operation by spring 2017, Berry said. Four trucks are participating in the trial, Berry said. The Kenworth Trucks division of Bellevue, Wa.,-based Paccar and BAE Systems are teaming up to provide a hybrid truck that runs on compressed natural gas, as is TransPower. TransPower, a Poway, Calif., company that designs eco-friendly technology for heavy-duty vehicles, is also offering a battery electric truck. Volvo subsidiary Mack Trucks is bringing a diesel hybrid vehicle. 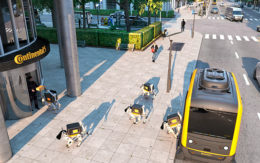 Siemens’ system will use a jointed framework known as a pantograph, which conveys the current from the wires to the vehicles, relying on sensors to connect and disconnect at speeds of up to 55 mph. The power they collect can be funneled directly to the electric engine or to battery storage. The trucks will rely on an electric drive system, which can run on several power sources, including batteries or generators fueled by compressed natural gas and diesel. This way, the vehicles will still be able to operate even when a catenary system isn’t available. That independent drive capability eliminates the need for costly overhead lines on small arterial roads or surface streets, according to Patrick Couch, vice president of technical services for clean transportation and energy consulting firm Gladstein, Neandross & Associates. In addition to the California project — called the eHighway —Siemens is also testing catenary charging in Europe. In late June, the company began operating another eHighway project on a 1.25-mile portion of the E16 highway north of Stockholm. The two-year trial involves two specially adapted diesel-hybrid vehicles from Swedish automaker Scania. Like many other countries and municipalities, Sweden hopes to wean its transportation sector off fossil fuels within the next few decades. But the catenary charging system has several hurdles to clear before it can approach commercial viability. Electrification in trucking fleets is “still an emerging concept,” though one that is becoming better accepted, said Cathy Roberson, head analyst for consulting firm Logistics Trends and Insights. In September, DHL Express USA ordered 45 electric delivery trucks from Kentucky manufacturer Zenith Motors. Last July, BMW and auto services provider Scherm partnered in Germany to test a 40-ton electric truck, built by Dutch truck manufacturer Terberg and charged entirely using renewable energy. But integrating wayside charging systems into existing transportation systems can be a “difficult and costly” process, requiring roadway modifications, adjustments for pipes and power lines and extra space for power substations, Couch said. There’s also the question of how to pay for the set-up, he said. Who owns the catenary system? Who pays for development? How is revenue generated? What is the best way to charge tolls? The contract to launch the Southern California project — the first of its kind in an urban, industrial zone — was signed in July 2014, said Berry from the air quality management agency. But the experiment has run into “a lot of complications in terms of permitting, traffic and other issues that have taken a very long time,” he said. The total cost — including the adapted trucks, the catenary line, the test track and the electrical upgrades — is expected to be $18 million, Berry said. TransPower battery electric trucks being built in Poway, California that will be used on the system being built there. 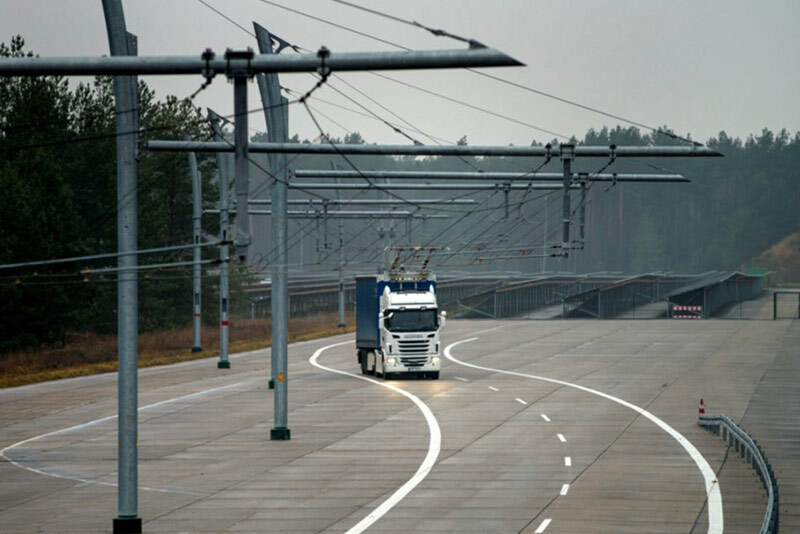 The test is designed to generate data on how far trucks will be able to travel on a catenary charge. A successful system could allow trucking companies to go electric without putting as many heavy, expensive batteries on board the vehicles, Berry said. The Siemens catenary pantograph technology may play a key part as freight transport gradually goes electric, said Melissa Lin Perrella, senior attorney at the nonprofit advocacy group Natural Resources Defense Council. Or some other method may prevail, she said. The system is like the 19th century mail routes, where exhausted delivery horses were swapped out at way stations for fresh animals. In Bedell’s version, drivers could trade electric truck tractors with depleted batteries for a newly charged set of wheels. Fuel makes up roughly 35 percent to 50 percent of trucking companies’ costs, Bedell said. Using electricity could halve that. Opbrid, which was purchased by Swiss electrification company Furrer+Frey in February, makes Busbaar fast-charging stations for urban buses. The Pony Express model has yet to be tested, but Bedell said it could be easier to scale while requiring less infrastructure than Siemens’ catenary plan. “If the basic economics for profitability are there, then the environmental benefits simply come along for the ride,” he said.